Break the Sunday Tradition with Sukiyaki! 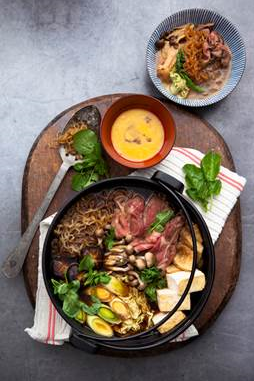 Gather friends and family round the dinner table with this beautifully simple dish for sukiyaki, a popular Japanese hot pot. Thin slices of beef, cubed tofu and a variety of fresh vegetables are simmered in a delicate broth that’s surprisingly sweet yet savory. For a truly Japanese experience, simply serve with a raw egg dipping sauce to enhance the flavor! Dice the tofu into bite sized pieces and cut the chinese cabbage and leeks into 5cm lengths. Remove the stems of shiitake mushrooms and score a cross into the top to decorate. Boil the shirataki noodles in salted water for 2-3 mins. Wash in cold water then cut in approximate length. Fry the sliced beef in oil in a deep frying pan to brown the beef. Add the cabbage, leeks, mushrooms and noodles and pour in a mixture of sake, tamari soy sauce, brown sugar and kombu dashi (or water) to the pan and bring to the boil. It should be cooked after 5 minutes. Break the egg into a serving bowl and beat gently to make the dipping sauce. Serve with the Sukiyaki. – Use fresh eggs for the dipping sauce. – You can keep repeating the prepared ingredients to the empty space in the pan to cook if it gets gobbled up quickly.